Arrive Kilimanjaro International Airport and transfer to Kigongoni Lodge in Arusha. Leave Kigongoni at 9am for Lake Manyara National Park. Arrive in Lake Manyara at approximately 11:30am and game drive for the rest of the day. Dinner and overnight at Kirurumu Tented Lodge. At 9am, leave Kirurumu for Ngorongoro Crater. Game drive in the Crater for five hours before proceeding to Ngorongoro Serena Lodge for dinner and overnight. The Crater's resident wildlife includes lion, zebra, cheetah, wildebeest, hippo, elephant, and flamingo. Leave Ngorongoro after breakfast for the Southern Serengeti. Game drive in the area until 5:30pm. Dinner and overnight at Olakira Mobile Camp. Spend a full day in the Southern Serengeti. Return to Olakira Camp for dinner and overnight. Spend a last day in the Southern Serengeti. Dinner and overnight at Olakira Camp. Depart Olakira Camp at 8am for Ndutu Airstrip. Your flight to Zanzibar leaves at 11:30am and you arrive in Zanzibar at 4pm. 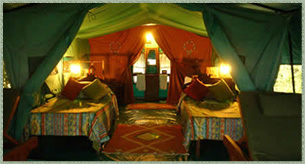 Transfer to Matemwe Bungalows for dinner and overnight. Spend the day at Matemwe Bungalows. Full-board accommodations. Leave Matemwe Bungalows for Stone town Airport. Take a short flight to Dar es Salaam to meet your International flight.